AUDUSD bulls, in the short-run, show some minor support at 0.7170-80 region, however, the pair appears to be vulnerable given the risk averse mood globally. The medium-term perspective: Australia’s poor GDP data was a notable setback to the domestic story but aside from forecast adjustment in Feb, the RBA is unlikely to change its tune, limiting AU yield downside. Commodity prices suggest AUD should be 0.7350 - 0.7400 levels but a very sour global risk environment will cap rallies. If the Fed enters 2019 still planning hikes, AUDUSD should head back to 0.69-0.70 levels in Q1 2019. Before proceeding further into the strategic framework, ahead of RBA's monetary policy minutes and Federal Reserve's hikes that are sheduled for next week, let’s just quickly glance through the positively skewed IVs of 3m tenors signify the hedgers’ interests to bid OTM put strikes upto 0.70 levels which is in line with above projections (refer above nutshell). While positive shift in risk reversals of short-term tenors are in sync with momentary upswings in the underlying spot fx, bearish delta risk reversal across all tenors also substantiate that the hedging activities for the downside risks, refer 2nd (RR) nutshell. Accordingly, we have advocated delta longs for long term on hedging grounds, more number of longs comprising of ITM instruments and capitalizing on prevailing rallies and shrinking IVs in 1m tenors, theta shorts in short-term to optimize the strategy. Theta shorts in OTM put option would go worthless and the premiums received from this leg would be sure profit.We would like to hold the same option strategy as stated above on hedging grounds. Thereby, deep in the money put option with a very strong delta will move in tandem with the underlying. 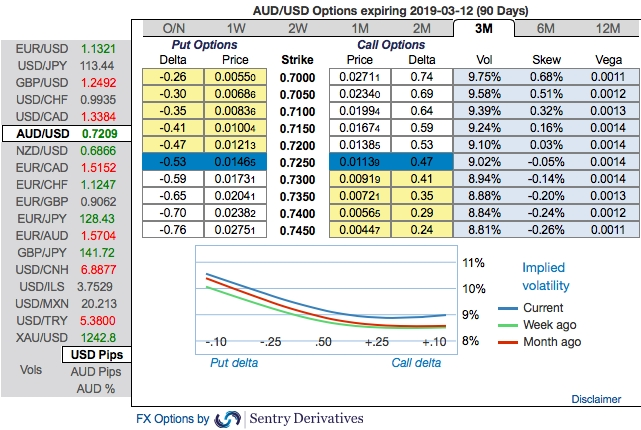 Currency Strength Index:FxWirePro's hourly AUD spot index is inching towards 13 levels (which is neutral), hourly USD spot index was at 122 (bullish), while articulating (at 08:55 GMT).